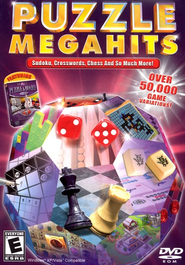 Puzzle Megahits is a must have puzzle collection if you enjoy mega puzzle variety. Experience the widest range of puzzles that will challenge your mind while entertaining you for hours on end! Hoyle Puzzle Games, Hoyle Board Games, Jewels of Cleopatra, Newspaper Puzzle Challenge, Word Krispies.